So who likes to win free stuff? Today is your chance! We’re giving away a copy of the FaithWriters anthology, INSPIRATION AT YOUR FINGERTIPS. This book is made up of 80 Challenge entries revolving around a Computer theme. Read stories, essays, and poems about topics like End, Space, Break, Help, Control, Home, and more. Inspiration can come from almost anywhere–mountains high, valleys low, by a crashing ocean, or beside a babbling brook … it can even come from a special family moment around the kitchen table. It can burst into life in moments of greatness, or flicker in the dark during times of weakness. 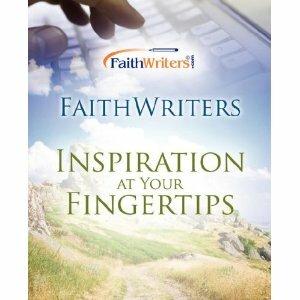 Surprisingly, it can also come from the mundane and most ordinary of things, like the words on a computer keyboard–which is exactly where it came from for FaithWriters’ ninth anthology, Inspiration at Your Fingertips. Join with over 50 award-winning authors from FaithWriters.com as they explore such open-ended topics as “Home,” “Space,” “Lock,” “Escape,” and “Break.” The end result is a collection of 80 inspirational stories, poems, devotions and articles that will surprise and delight you. FaithWriters–Inspiration at Your Fingertips will encourage you in your walk with Jesus, lift your spirit, and bless your soul. It may even change the way you look at your computer keyboard forever. Simply leave a comment on this blog post to be entered in this giveaway. One winner will be randomly selected and annouced on next Thursday’s blog post. Mind over Madi – Includes Giveaway! Who will Soon Have Inspiration at their Fingertips? Would love to win an anthology that has all my favorite peeps in it! What an interesting concept—inspiration from the computer keyboard. That goes to show that inspiration is everywhere. We just have to be open to it. Hope I win! Awwwwl, I wish I had been on Faith Writers when the ‘contest’ was going on! I’ve written a couple of devotions using ‘computers’ as the ‘lead in’. Ah, well, perhaps I’ll win the book and enjoy the contributions of others. Thanks for the opportunity! Of course, I’d like a Faithwriters anthology. I can’t wait for all of them to be printed. See you at the conference in August! We all need to be encouraged. Thanks for compiling these writings in one place. I hope I’m the lucky recipient of the book. Tossing my hat into the ring, please my name to the drawing. I’d enjoy that book. I started a new blog last week about writing memoirs and part of my “job” is to inspire story ideas for people. Your book sounds delightful and would inspire me to inspire others. I love to learn and glean from other writers! I am interested in writing anthologies, so would so appreciate this collection, so not only can I study and learn, but also take away some of their inspiration, and see and hear God through their eyes(fingers?). God speaks in many ways, and I am sure He is speaking in and thru this collection. Thanks for the opportunity! Since my computer wishes it only had a brain to inspire, the book might help. . .
Would love to start a collection of FaithWriter Anthologies, beginning with this one. Good luck to everyone! What is held so dearly at the fingertip can’t be secured. It was meant to rush to waiting hearts. Treasured seeds from our heart flowing from our fingertips, awaiting a listening ear, gives birth in another’s heart. I have been wanting to look into the Anthologies! I am kind of new here and haven’t really had the chance to take advantage of everything offered here. Love Faithwriters and hope to branch out in other areas as I learn my way around. Please put my name in the hat for the free Anthology! Would love to have it! (Happy Mother’s Day to me, maybe? I’ll go along with that!) Thank you. God bless! Inspiration from anywhere! That is what I am finding as a new member of http://www.faithwriters.com as I have renewed my love for writing this week,and found stories lurking in the blooming pink and red Columbine plant in my garden, and a loving place to share and learn as I peruse FW website and boards. It is a good idea. A blessing to whoever wins! What a great idea. Am so looking forward to reading how God is speaking to others in His body today! Always like to read others inspirational thoughts. PICK ME please. I LOVE Faithwriters! It would be a joy to have this book and see the end product of the Challenges. Faithwiters is a fantastic site! I enjoyed the article and would like to be entered in the drawing. I am a platinum member… just been busy taking care of the family! Hope to get some articles written and posted soon! Thank you for the invitation. I will be happy to have you sign me up for the anthology give away! Thanks for this opportunity to enter the giveaway. I appreciate any help I can get. I’m new here but I love it so far! I would love to have the book, so please, enter my name in the contest! That topic series must’ve been before my time at Faithwriters, but it sure would be fun to read! Bring it on! Count me in! Would love a copy. Count me in! I would love a copy. INSPIRATION AT YOUR FINGERTIPS is a title that sounds great to me. What author wouldn’t like to have more powerful inspiration these days! There is nothing better than reading stories of faith by people who want to share theirs! Please enter me into the drawing for this book, I’ll share it with ALL!! God Bless! I would be happy to win this anthology. Looking forward to the new ones, too! Yes, I would like to win this Faithwriters anthology in this giveaway! Count me in! I’d love to win!! Thank you for the opportunity to win a beautiful book. Wednesday blessings to all! Count me in–I’d love to have an anthology. Oh, I would love to win one! This might be one that I’m actually in! I would love to be blessed with winning, I say always I hold the pen while God dictates the words. The above is my own personal website. I appreciate the comments so I understand which way the Lord is leading me.